Online business owners need more than that. A perfect email marketing solution for eCommerce websites needs to provide advanced automation, flexible customer segmentation and the ability to recommend products based on customers’ behaviors on site. If you’re looking for such a powerful thing, this article will introduce to you Mailbot – one of the best Mailchimp alternatives singly focusing on growing conversions and sales for eCommerce stores. Born to help you work less but be able to sell more, Mailbot has superior features that override Mailchimp itself and other Mailchimp alternatives. Spend around 60-90 minutes on weekly newsletters from drafting messages, picking products, adding images to scheduling. Every subscribers will receive the same newsletter. If you want to filter customers, for example the new and the frequent buyers, you will have to create separate groups of customers and create customized newsletters for each, thus double or triple the work. Weekly newsletters in Mailchimp thus cannot be personalized based on customers’ individual interests and behaviors. In Mailbot, automation and personalization is brought together by Newsletter Bot to free you from all those hassles. Built to be your virtual email assistant, Newsletter Bot helps you plan weekly personalized newsletters, so you don’t have to manually prepare the same newsletters every week or month. In each campaign, there is a library of email subjects and bodies where you can input for Newsletter Bot to randomly select for each week’s campaign. Newsletter Bot will make sure consecutive emails have different subjects and content not to bore recipients and make them feel like they are receiving emails from a robot. Without your permission, Newsletter Bot will not automatically send out emails. Instead, it will draft your campaigns and notify you 3 days in advance. All you have to do is simply review, edit if necessary, and approve bot-generated emails weekly, then it’s good to go! What if you want go into more detail like this: Customers who have purchased at least 1 item in your Armani jeans collection within the last 7 days, or Customers who have viewed your Oxfords collection the last 3 days but haven’t made any purchase? If you want to target customers that deeply, Mailchimp’s pre-built segments are definitely not enough. 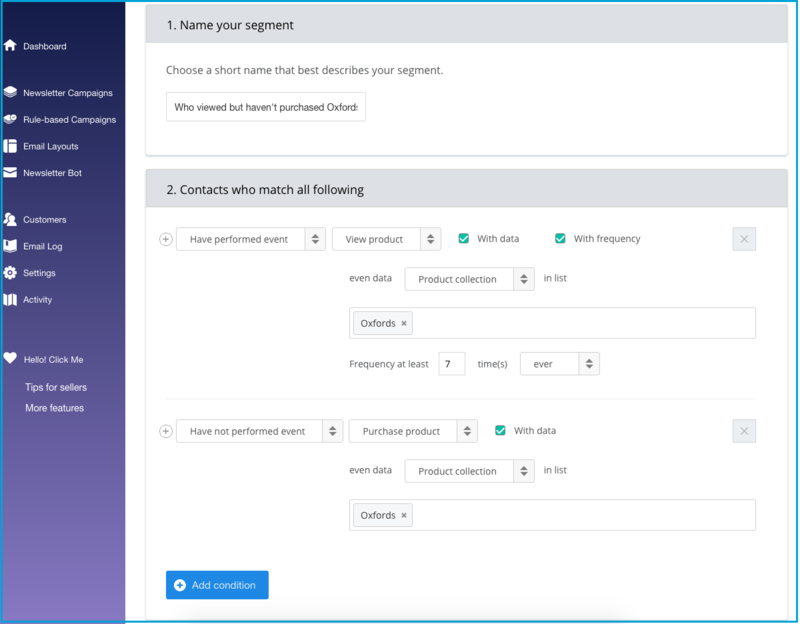 Creating such a smart customer segmentation tool that gives you 100% flexibility, Mailbot empowers you to reach any customer based on their actions on your store. Comes along with the customer segmentation is rule-based campaigns that send out when a customer enter a specific segment. Since customer segmentation in Mailchimp is quite limited to its pre-built segments, rule-based campaigns are thus limited too. 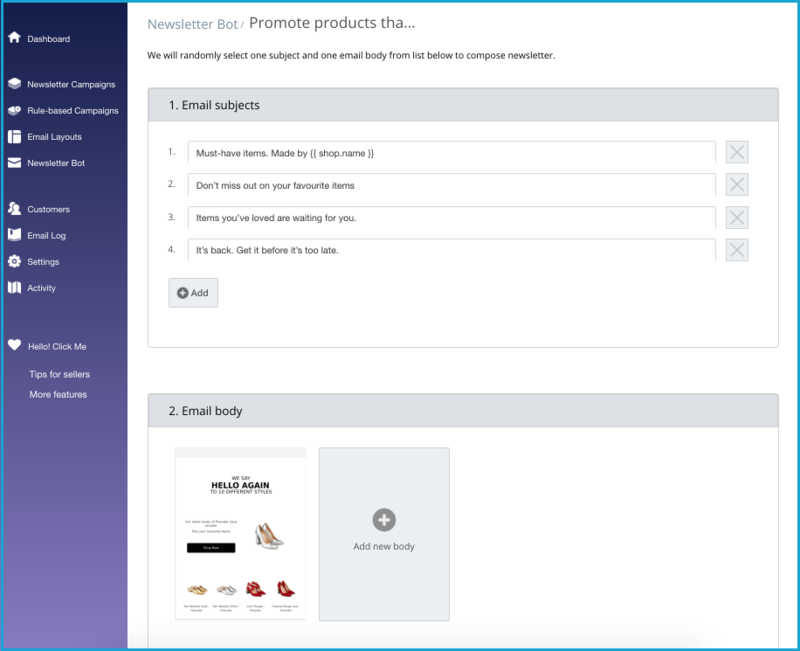 Mailbot as a powerful Mailchimp alternative brings Rule-based campaigns to the next level to help you generate sales from every single visitor on store. When you activate Mailbot, there are already 4 rule-based campaigns that are pre-designed, well written, and ready to go out. While Happy Email helps you build relationship with new customers by a follow-up thank-you email from the store’s Founder, Reward Coupon further extends brand love and trust in your loyal customers. During the whole customer journey, Sales Nurturing and Sales Return actively follow ups whenever customers leave a cart unpaid, or haven’t come back to the store for quite a while. It isn’t enough, is it? No matter how well we’ve done research from our collected data, we never know your customers as well as you do as the owner of the brand. Thus, we enable you to create unlimited custom rule-based campaigns with Mailbot that you think will work well to lift up conversion rates and generate sales. Unlike Mailchimp as a universal email marketing engines for any kinds of businesses, Mailbot serves as an eCommerce-focusing solution, built exclusively for online business owners. Every settings or campaigns from the smallest we design in Mailbot aim towards improving conversion and boosting sales. New Arrivals: detect and pick newly listed products into New Arrivals campaign to introduce to customers. Site-wide Recommendations & Collection Cross-sell: sends personalized product recommendations to the right customers at the right time based on their behaviors and interests on the store. Cross-selling has never been so easy with email marketing. Sales Nurturing & Sales Return: bring back customers who have abandoned carts or haven’t come back to the store after a long while and encourage them to pay or purchase more. Promote products that can be bought again: remind customers that their old items is about to expire or run out and that it’s time to purchase again for continuous usage. Plus, here at Mailbot we believe in this principle: Trust the numbers and let them guide you to success. Thus, we put a lot of hard work into building a comprehensive and detailed Report Dashboard to help you be data-driven and make wise decisions based on the statistics. 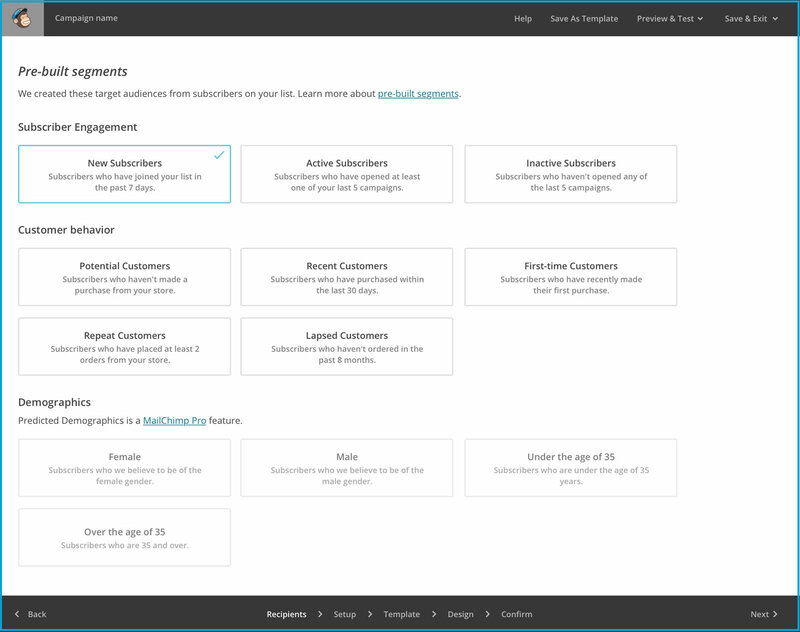 Keep in mind: Mailchimp’s powerful features for eCommerce are only exclusive in the $199 Pro subscription excluded from the fee based on number of contacts. For small self-bootstrapped businesses, access to a full eCommerce email marketing solution can be very costly with Mailchimp. Meanwhile with Mailbot, all features are unlocked no matter what package you’re in. Mailbot: $29 for unlimited access to full features in the app. A channel that has impressive 3800% ROI, email marketing will never be old. The only thing old is the way you make the most out of it. Let Mailbot – an affordable and perfect Mailchimp alternatives for eCommerce entrepreneurs – help you leverage email marketing the right way: personalized, automated and cost-effective.